Waterproof digital cameras are a great choice for holidaying families, festival goers and outdoor types. 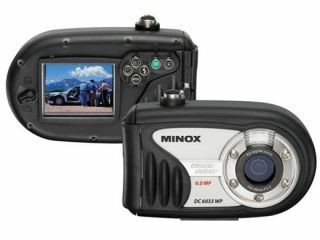 Housed in a rubber case, the 6-megapixel Minox DC6033 WP can be taken underwater to a depth of 10 metres. Specs include a 4x digital zoom, multi-coated Minoctar lens with a 42mm foxed focal length, 2-inch TFT screen, built-in flash and an SD slot for boosting the memory up to 2GB. There’s no word when the Minox DC6033 WP will go on sale over here. In the US, it looks set to cost $299 (£150).